In Charles C.W. Cooke’s fantastic piece in National Review last week on the power of emotion in the gun debate, he made an excellent point; facts and statistics aren’t enough. We Real Americans absolutely crush the gun-grabbers at every turn on the facts and the statistics. And it shows; the American people are casting off the detritus of decades of leftist, statist propaganda; gun control is now a minority position (and while support for gun control even at the worst was a mile wide and an inch deep, America’s shooters are passionate and committed), and the NRA is more popular than President Obama. But it goes way beyond facts. So this week, I’m going to leave statistics aside for a moment, mostly, and focus on the the philosophical, historical, and yes, emotional reasons to support the Right to Keep and Bear Arms. Ideals: America is unique in the world in many ways – but the most important is that we are the first and only nation built on ideas rather than a common piece of land, language or bloodline. It was the first nation in history that one could join, rather than be born into. That government was in short of, by, and for the people. “Defending” any of the earth’s other nations was a matter of repelling encroachment on a geographic border, a bloodline, a language. But while the US had borders for defending, the most important thing to defend was the ideals around which we were formed. And our most likely enemy? Ourselves. Shared Responsibility: And so the gun became the means by which Americans protected not only their nation, but its ideals. The Constitution captures – as imperfectly as all other human endeavor – this idea in the Second Amendent, to which I’ll add emphasis: A well regulated Militia, being necessary to the security of a free State, the right of the people to keep and bear Arms, shall not be infringed. The anti-gun left focuses, tangentially and dishonestly (and, since Heller vs. DC, futilely) on the “well regulated” clause; shooters focus, correctly, on the “shall not be infringed” bit. But the most important idea is that this militia (whatever it is, whatever “well-regulated” means) is necessary for the security of a free state. 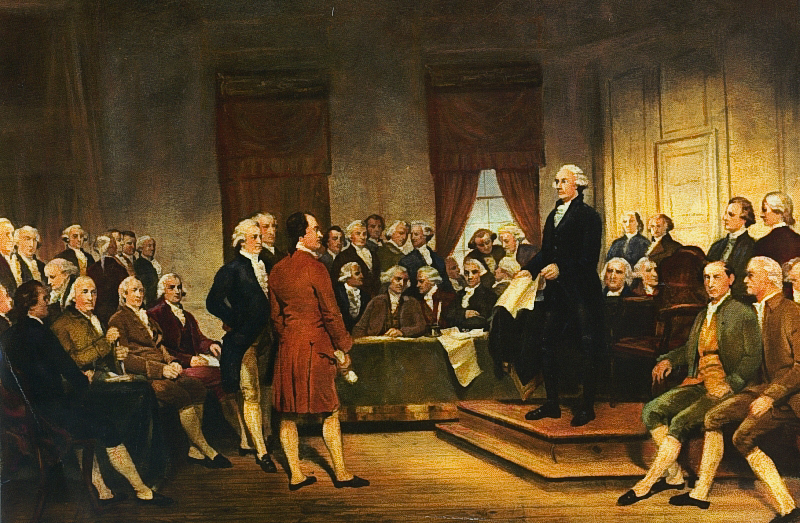 And to the Founders, “a free state” meant the ideals. Remember – every state calls itself free. The Soviet national anthem referred to “Freedom” four times; the North Korean government says it governs a free nation, and the people had better say so or they’re in big trouble. To one recent government, “work makes freedom”. …unless you can defend it. And the founding fathers believed that government was the last ˆthing you could unconditionally trust with your freedom. History has shown them correct, over and over and over. Every “nation” in the world has guns. Even Iceland, the most pacifistic significant nation on this planet, has men with guns – few of them – with the mandate of society to use them. It was the same mandate that the SS had, and that the North Korean state has today; that Iceland’s society gives a more benign, civilized mandate than the Nazi Party did and the North Korean communist party do today is a happy accident for Icelanders, and a rare thing indeed throughout history. And so a fundamental assumption in American history is that we are built around the ideals of freedom – and the responsibility to protect that freedom at the ballot box, in the jury room, and heaven forfend, the battlefield. And the gun-grabbers ignore that history – and the Real Americans’ knowledge of it – at their peril. To sum it up in a sentence: It’s not about the guns. It’s about our history as an independent, self-sufficient, self-regulating people who value and protect our freedom. This entry was posted in Grass Roots, Liberty, Victim Disarmament by Mitch Berg. Bookmark the permalink. Many of the things we are come to us at our conception. The US was born of a popular, armed, and lengthy insurrection that successfully vanquished its former master in battle, a ‘tyrant’ accused of occupying with a standing army, over-taxing and over-regulating. The resulting regime was created as a reaction to the defeated one and as a reflection of what made the insurrection successful, and then proceeded to expand violently and successfully to the West. That combination just hasn’t happened again, not in a manner that resulted in a long lasting free and democratic republic. I’m not one to argue that US is populated by exceptional people, but the US, by nature of its birth, is an exception. So it is not surprising that it has exceptional views on guns (exceptionally stupid, perhaps). Frankly, as a nation, over the long haul, our experiences with guns have been on balance positive. A lot of Americans believe that most people can be trusted with guns (we’re actually very trusting), and as for the rest, we should deal with them ourselves, by shooting them. It’s not a very practical solution, but it is idealistic, in a very American way. This is inane. The United States was founded on enlightenment values. In otehr countries, the ‘new regime’ learned the lessons of the old regime and became more oppressive (see French Revolution, Russian Revolution). It’s a WaPo opinion piece that suggests forbidding people under 25 from possessing firearms, because they commit most of the gun violence. Bully, I say. But surely, if we are going to use modern statistical techniques to see who will commit ‘future crimes’, surely we can make the firearm possession ban more grained than just people under 25. What groups of people under 25 commit a non-representative amount of gun crime. Men more than women certainly, and I am dead certain we can make even finer calls than that.People who didn’t finish highg school, or maybe people with one or more siblings in the prison system. Howabout people under a certain income?